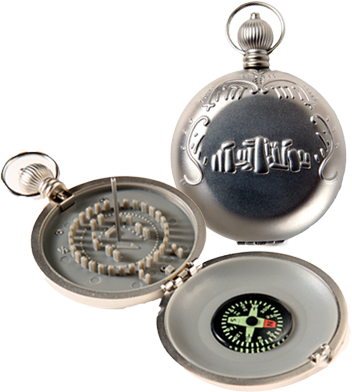 Begin your journey by pressing the watch stem atop the rugged alloy watchcase and witness the mystery of Stonehenge revealed! Inside you will see the exact scale replica of the major components of the 5,000 year-old megalithic monument we know as Stonehenge. Using the easy-to-follow, illustrated instructions, you’ll quickly want to share with your family, friends, and associates the wonders of your Stonehenge Watch. Truly one of the most mystifying monuments in history, Stonehenge stands today as witness to the indomitable human spirit and our collective quest to forever mark our place on this planet. Harness the power of the sun and stones by orienting your watch with the accompanying high viscosity compass. Predict the exact moment of the winter and summer solstices. Witness the changing of the seasons on the spring and vernal equinoxes. Prove the accuracy of the Stonehenge Watch by confirming your calculation of the time with the front facing analog watch. Your Stonehenge Watch will identify you as a sophisticated individual with a keen eye for a unique collectible. and makes a treasured gift. and developed by Idea Works, Inc.
companion booklet by Peter Payack. 5,000 years ago, there were no telescopes to help people see the true nature of the heavens. People had to rely on the appearance that the sun revolved around the Earth. It wasn't until the 1500s that Nicholas Copernicus proved the Earth revolved around the sun. How to Tell the Seasons. At midday, the shadow will be cast directly north parallel to the north arrow embossed on the stone plate. At noon, the shadow will also be at its shortest. When the Sun rises and sets the shadows will be their longest. Once you have mastered orienting your watch to face north, you are ready to predict and observe the four solar events: the autumnal equinox, the winter solstice, the vernal equinox, and the much-heralded summer solstice when the sun rises directly over the Stonehenge Heel Stone. Click here to learn How to use the Watch or to read more about How to Tell the Seasons. 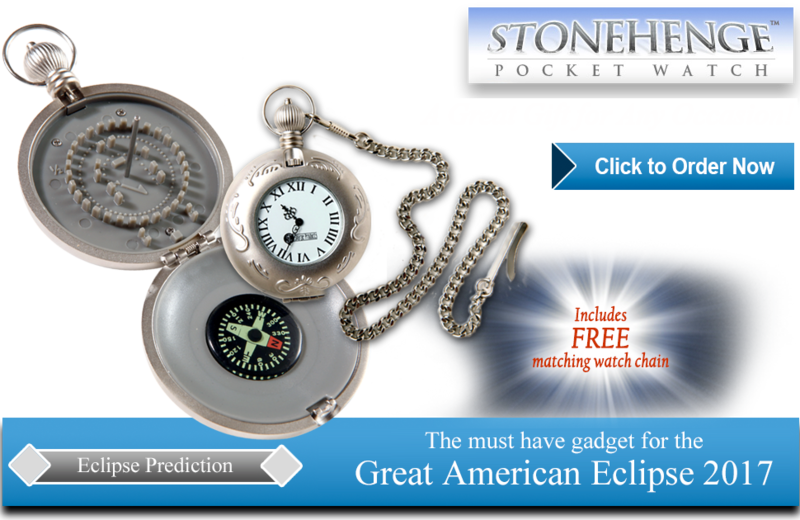 Now, you too can hold the legend and ageless wonder of Stonehenge in the palm of your hand by claiming The Stonehenge Watch as your own. Idea Works, Inc. is a New Jersey based company with aspirational goals that are more than just interesting and intriguing but thought provoking and educational. We are constantly working on new products and innovativations. Stop by our website on occasion to view and check for new products. Idea Works Incorporated warrants for a period of 90 days from your purchase that your Stonehenge Watch is free from defects in workmanship and materials. If your watch proves defective during the warranty period, return the watch together with proof of purchase, to Idea Works Incorporated. We will, at our option, repair or replace the defective part(s). This warranty does not cover accidental damage, abuse, or misuse. If you are not satisfied with your item we will gladly refund the full purchase price. We will not refund or cover postage costs for returned items. Copyright © 2017 Idea Works, Inc. Designed and developed by Think Creatively Solutions, LLC.